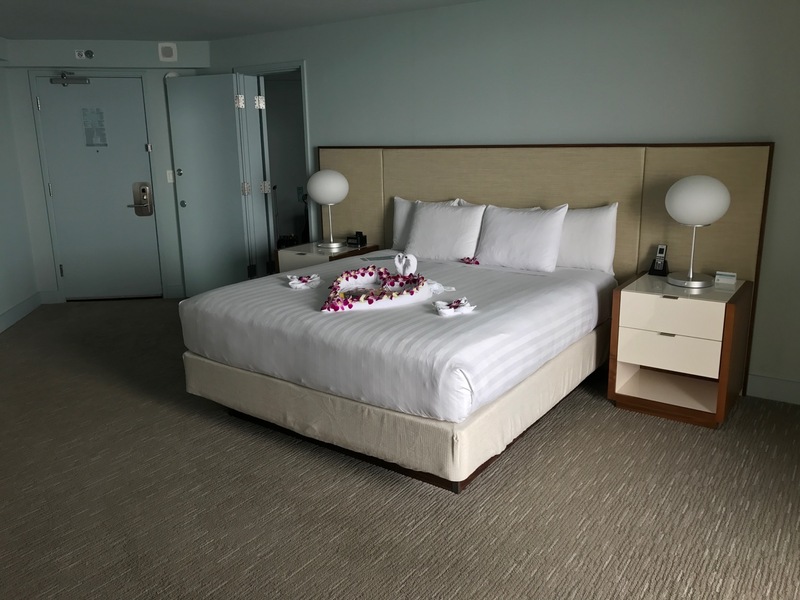 Yesterday I reviewed the Hyatt Regency Waikiki Beach in Honolulu. Today, I want to separately review the family ocean suite, perfect for a family traveling together. For all I rave about the Kahala, if you are on a budget and wish to balance luxury with affordability, the family suites provide a great solution for families of four (or more). World of Hyatt Globalist members receive four confirmed suite upgrade each year that can be used on a space-available basis to confirm a suite upgrade in advance. At some hotels, these suites upgrades are more valuable than others. This hotel provides Globalist members with a fairly large suite, essentially two rooms for the price of one. And indeed, these are two rooms in which the adjoining door between them is opened. Each has a “Murphy” (folding) bed, a bathroom, and a balcony. The beds are comfortable and I like that they can disappear. Even if you are traveling alone or only with a spouse or loved one, you can fold up the bed and use one room as a living room and the other as a bedroom. The rooms are connected by a two-way door. I appreciate the family-friendly suite upgrades available at the Hyatt Regency Waikiki Beach in Honolulu. For a full review of this property, please see here. park Hyatt hotels are so MUCH better places to use suite night upgrades. Any chance you can post pictures of the view you get from the room? Thanks. Hope you had the Family Suite with the ocean front double balconies. Despite all the extra room, there are better hotel options closer to the ocean in that area.